A group of teenagers re-enacting the plot of the film 'The Purge 2' in Chicago murdered over 112 people. Claim: A group of teenagers re-enacting the plot of the film The Purge 2 in Chicago murdered over 112 people. There is an article from SOCIVIRAL.com which claims that “112 Murdered By Group Of Teens Reenacting ‘The Purge 2′ Movie In Chicago”. I was just wondering if this is true or false. 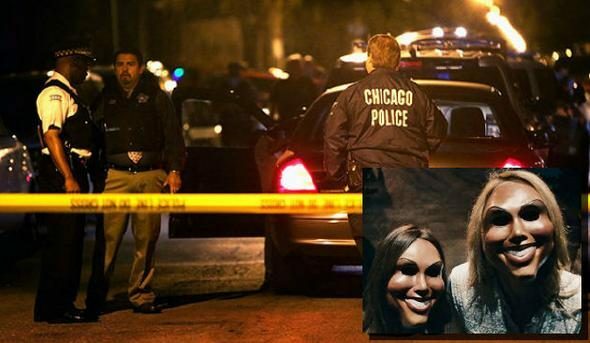 “It’s almost like Chicago’s trying to beat its on record of people killed in one night,” said one of Chicago’s finest about a mass killing that took place shortly after the debut of ‘The Purge 2 Anarchy’ movie Friday night. In a reenactment of ‘The Purge 2’ movie a group of teens went on a violent killing spree in the city of Chicago claiming the lives of over 112 people. Police say there have been no arrest made as of yet, but will be closely monitoring social media sites waiting for the teenage murderers to brag about their exploits while not knowing they’re just telling on themselves. CreamBmp.com Written by comedian CREAM. This website is comprised of satire and parody of current news and urban culture. For entertainment purposes only.